So far in a year I have had no maintenance for this fern. Nothing from the ordinary cutting back in the winter, etc. I love these because as long as you keep them in the shade with little sun and give them water they will grow. Maidenhair Fern can be found all over the world so isn’t native to anywhere and can only be seen as long as its conditions are correct. They are typically found along Riverbanks, close to hot springs, in the Crevices of Cliffs and many other places. There is an extensive range of areas. This particular Fern Grows. Even with that, it is a threatened species in Australia and Canada. It does not like to dry out for even a short time. You must keep it well Watered; It will grow happily Indoors or Outside. Choose the spot for your fern carefully in a beautiful, well-lighted place but avoid direct sunlight to prevent drying it out, which leads to burning. They can also be located growing in a lot of areas such as wooded areas where the soils are moist, and the locations are shady. Maidenhair Ferns are great to use in natural areas and also around large trees where the sunlight does not get. This is a great way to bring in lots of color and vibrancy to an area or garden.Native to temperate and near-temperate regions east of the Mississippi River, maidenhair fern (Adiantum spp.) is an herbaceous perennial. Maidenhair ferns grow one to two feet high in partial or deep shady areas of deciduous woodlands, thriving in the rich woodland soil. They have light, gray-green foliage on dark brown or black stems. Maidenhair Ferns are easy to grow which makes them very popular with gardeners and homeowners. The darkness of their stems contrasted with the bright color of their leaves makes the leaves appear to float in the air in their native forest. Maidenhair ferns spread about two feet across with their fronds up to 12 inches long. 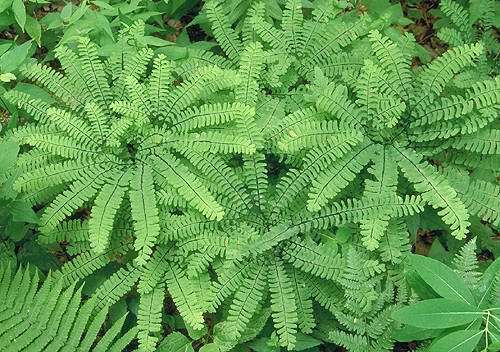 Each frond grows horizontally with up to 24 pairs of leaflets spiraling along it. Initially fan-shaped, the leaflets become oblong as they mature, but the terminal booklet retains its fan shape.